Clean and efficient energy is good for business. Even better, there are great financing options, grants and incentives available to help you make the switch to cleaner, more efficient energy for your business. Running buildings and operations with less electricity, gas, and oil lowers operating costs. Energy-efficient and environmentally-responsible buildings are more comfortable, have more positive responses from consumers and employees and often have increased market value. Renewable energy can lower energy bills, reduce greenhouse gas emissions, reduce service disruption, and contribute to a healthier environment. Commercial Property Assessed Clean Energy (C-PACE) financing allows commercial property owners to access flexible, 100% upfront financing to make energy efficiency and clean energy improvements to buildings. Energy improvements lower the property’s energy expenses and make it more comfortable and inviting for tenants. These investments are repaid over time through an additional surcharge on the property tax bill. C-PACE financing requires zero percent down and can provide lower rates and longer terms than traditional financing, allowing projects to be cash flow positive from day one. In Howard County, C-PACE is available for loans greater than $15,000 and for terms up to 20 years. C-PACE projects can focus on a single energy conservation measure such as a new high efficiency boiler or a renewable energy system, or they can involve multiple energy saving measures. Some examples include HVAC upgrades, building energy management systems, high efficiency lighting, geothermal, upgraded insulation, new windows, and solar energy. Howard County adopted C-PACE in 2016 to support the County’s greenhouse gas emissions and energy use reduction goals, create local green jobs, and provide more opportunities for businesses to save energy and lower operating expenses. You can learn more about how C-PACE works, how to register to become an official C-PACE contractor and hear about the benefits from participating building owners by visiting www.md-pace.com. Both BGE and Pepco offer incentives to help businesses of all sizes save on energy upgrades. These may include energy efficient lighting, heating and cooling equipment, refrigeration controls, small or large building tune-up services, building operation training, new construction and major renovations, and more. Most programs include technical assistance to help identify and analyze specific projects, financial incentives that cover 40-75% of the costs of energy efficiency projects, and flexibility to have the work done by in-house staff, contractor of your choice, or participating service provider. For more information, visit these direct links to the BGE and Pepco business programs. In Maryland, you can choose your electricity supplier. Your bill will still come from your regular utility company, (BGE, Pepco) but you may get a better rate and you also can choose a supplier that provides renewable energy, such as solar or wind. Visit the You the Maryland Public Service Commission website to learn more and use their comparison tool based on your estimated monthly electricity use. 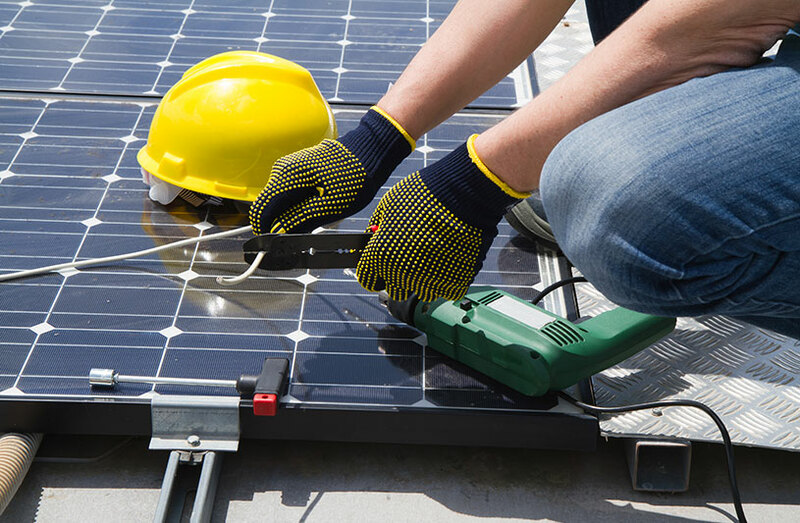 Your business can save money on electric bills, hedge against rising electricity costs, reduce greenhouse gas emissions, and show leadership by adding solar energy systems to your property. If you pair solar with battery storage, your business can operate independently of the utility grid during natural disasters and other emergencies that cause power outages. Options include owning the solar energy system yourself or entering a power purchase agreement or lease. Owning the system outright yields the greatest savings on electric bills, but upfront costs may be challenging. Grants and financing options are available to help defray these costs (including C-PACE, described above). Power purchase agreements typically result in lower annual savings, but do not require upfront investment or continued investment in system maintenance. Here is a good summary of options for organizations provided by the non-profit Solar United Neighbors. For more information on incentives, including tax credits for solar energy systems, high performance buildings, and more, visit the Incentives page on this website.